Spelsbury War Memorial Hall, a registered charity (no 304370), was built in 1921 as a memorial to the people of the parish listed on the rolls-of-honour, who served in WW1 (until boundary changes in the mid-1980’s Spelsbury Parish also included the hamlet of Fulwell). The hall is available for hire and offers the main hall with a small stage; a small meeting room/serving area; a kitchen with fridge and catering size cooker; a bar area for hot and cold drinks with a direct feed hot water boiler and fridge, there is a serving hatch from the bar into the main hall; there is an accessible toilet and baby changing facilities. The hall has some crockery that can be used but no cutlery or glassware. The Hall is licensed to accommodate up to 125 people (100 seated); there are 99 chairs, 10 large rectangular tables and 10 small square tables. If you would like to book the hall please see contact us at [email protected] or telephone 01608 813055 for more information about availability. 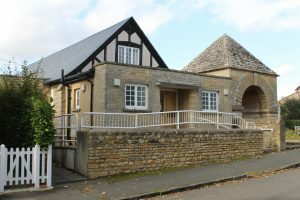 The hall is ideal for classes, exhibitions, talks and small social events; we are unable to take bookings for noisy parties. Regular activities in the hall include meetings of Spelsbury Women’s Institute and Spelsbury Parish Council, two art classes and a yoga class. The hall, and the adjacent water fountain, is cared for by a small voluntary team of Management Trustees; ownership of the buildings is vested with the Official Custodian for Charities. The charity holds an annual public meeting in October, at which Trustees are appointed for the coming year; the current Trustees are: Helen Datson, Maxine Hobill, Rick Leyland and Ann Timbs. See the Charity’s registration details on the Charity Commission website. The hall was refurbished in 2004 at a cost of £180,000, much of this sum was raised through village events and appeals. 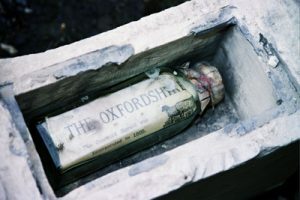 During the refurbishment a time capsule was discovered – and replaced in the wall with a few extra items added.